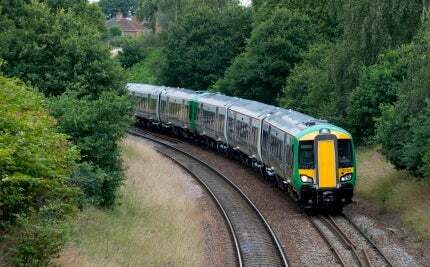 The Go-Ahead Group has awarded Knorr-Bremse two contracts to fit a state-of-the-art driver advisory system on the diesel train fleets at London Midland and Southern. The LEADER Driver Advisory System (DAS) will be installed on 23 Class 170 DMUs and 27 Class 172 DMU trains operated by London Midland, and 16 Class 171 DMU trains operated by Southern. In all, 132 LEADER cab sets are being supplied. LEADER DAS is an advanced, computerised system which helps the driver to deliver optimum performance against the timetable. The system will also result in less fuel being used and therefore will realise energy savings and a reduction in carbon emissions. Fitted inside the driver’s cab, LEADER DAS uses real time information about the train’s dynamics, the timetable and the route profile, including specific topography and speed limits. The system continually calculates the correct speed in the prevailing circumstances for a specific route, with the cab display showing the driver in advance how and when they can adapt their own driving style to optimise the progress of the train as the train progresses along that route. Phil Margrave, Go-Ahead’s Group Engineering Director said: "The installation of the system supports our commitment to seek new ways to cut our environmental impacts and work towards our target of reducing our CO2 emissions per passenger journey by 20% by 2015. During trials LEADER demonstrated impressive energy savings across a variety of different routes." Paul Goodhand, Managing Director of Knorr-Bremse in the UK added, "We are pleased to be working in partnership with Go-Ahead on these new contracts which are the first we have signed in UK rail. The contacts comprise the supply of all necessary in-vehicle equipment from Knorr-Bremse including the main LEADER DAS and all back office support for the remainder of the two franchises. We will also provide back up for the system while it is in service." Installation and commissioning of the LEADER systems on both fleets is due to be completed by Autumn 2013.